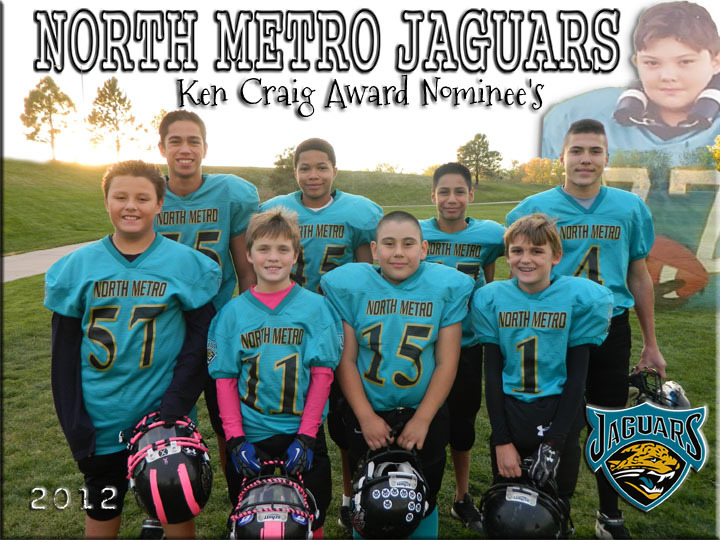 The Ken Craig award is given annually to the NMJF player or players, which most exhibit those characteristics that Ken embodied- Fair play, good sportsmanship, a never quit attitude and someone that works extremely hard both on and off the field. Ken would have loved to be honored in this way by NMJF, and Ken would have approved of both Deyvon and Jose to be chosen as this year’s award recipients. They both worked extremely hard both on and off the field as their schools, families and coaches have attested. They both exhibit a never quit attitude on the field and their teammates agreed that they are positive role models. Deyvon, we especially liked that you walk your grandmother’s dog even when you are not asked too just to help her out. We especially liked that you continually pumped up your teammates even when the game wasn’t going your way. Jose, we are so proud that you were there to help your family as a devastating personal tragedy struck all of you. You were a constant support to your family, your team and a source of inspiration for everyone around you, as you continued to attend practices and games with such a heavy heart. Thank you both for all your hard work and loyalty to your team. Our special thanks to NMJF President and the board members for taking the time and energy to Remember the “Very First Jaguar”-Ken Craig. 2012 Ken Craig Award Nominees.